A sock monkey goes to the dark side, or as dark as a sock monkey can get, in Kirk’s dovelike tale of dawning self-awareness. Readers meet Monkey on the first page. It is a close-up of his face, and he has a grump on. “You took my ball— / just like that! // You wouldn’t give my ball back. You wouldn’t share.” That’s four pages of text. Monkey does not mince words. “I had to grab it when you weren’t looking! // Now I have my ball / and YOU cannot play with it anymore!” Indeed, “YOU cannot play with ME.” Period, as it were. So Monkey goes about pretending he is having a good time with his ball. He will play by himself, with new friends (a houseplant, a rock and a worm) and even with the big dog—though the dog doesn’t seem interested in playing. Kirk is all emotive and deliberate. 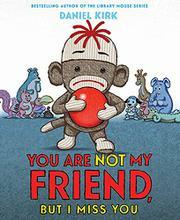 Readers can feel the initial indignation and then its ebb as Monkey—and Kirk’s digitally collaged artwork gives him not only plenty of pathos, but lots of wooly texture—feels the sting of his friend’s absence. “Maybe I wasn’t a great friend,” Monkey comes to realize. Easy-peasy, Monkey. Kirk’s skillfully paced mix of vignettes, close-ups and long shots guide readers smoothly through this emotional odyssey.